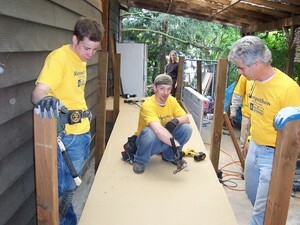 Erik Bittenbender, Ryan MacLeod, Roy Fleisher building the ramp. Jackson Remodeling Recognized for Rampathon Work. In a ceremony May 17th, Seattle Deputy Mayor Tim Ceis presented Leif Jackson and Roy Fleisher of Jackson Remodeling with a certificate of recognition from Mayor Greg Nickels. The document commends the Jackson team for their volunteer work building a wheelchair ramp for the Owens family of Greenwood. This is the third year that Jackson staff, trade contractors, and suppliers have joined forces to create access ramps for low-income residents. Their effort is part of Rampathon, a one-day blitz where hundreds of volunteer teams build dozens of ramps around the city. The annual event is organized by the Master Builders Care Foundation. 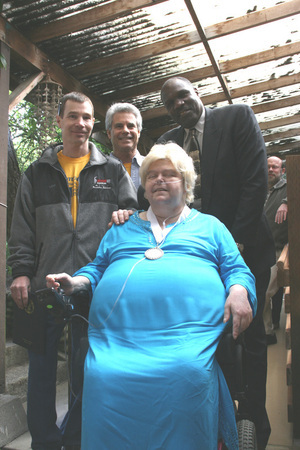 This year's project involved a North Seattle ramp for a legally blind, diabetic woman confined to an electric wheelchair. Despite her husband's efforts, she has been unable to take the chair outside of her own house, leaving her immobile at home. Prior to construction of the ramp, medical care was delayed because of this problem, and several times 911 was called, as an ambulance was the only way to get her to the hospital. Now Mrs. Owens and her husband have the freedom to get themselves to the doctor when care is needed. In a day, we solved that problem and more! Our colleagues, suppliers and trade partners rallied, and together we were able to accomplish much more than promised. In addition to the ramp, we replaced their narrow concrete walk, performed some much needed landscaping, repaired wiring and added lighting, and replaced a failing back door. Jackson Remodeling extends a hearty "THANK YOU" to the following companies and individuals for their generous donations: Limback Lumber, Greenlake Electric, Galeed Concrete, Cadman Industries, Frank Lumber, Plywood Supply, Tree Solutions, O'Connell Landscape, Atlas Construction Supply, National Construction Rental, and Rodda Paint. We also wish to thank our employees (and former employees, and others...) for giving of their time and expertise: Robert Gonzales, Erik Bittenbender, Ryan MacLeod, Elizabeth Luther Joseph Gray, Donald Bugge, Diane Jackson, Lis Weller, Patti Robins, and last but certainly not least, Roy Fleisher.